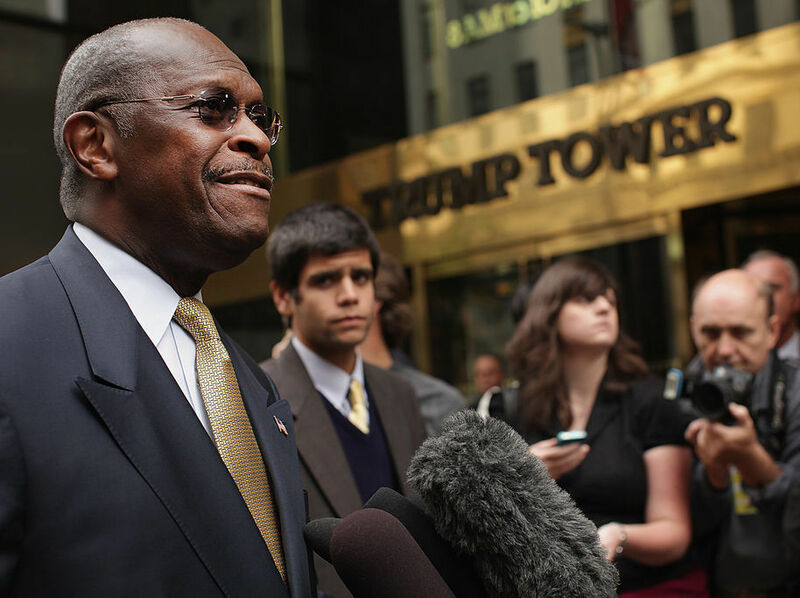 Yes, it was absurd for Trump to suggest nominating Herman Cain to the Federal Reserve. But the Fed is already political — our goal should be to make it democratic. Donald Trump unleashed fresh pandemonium recently when he briefly nominated pizza king, 2016 Republican presidential contender, and alleged sexual harasser Herman Cain for the Federal Reserve’s board of governors. Cain’s short-lived nomination was insult to injury after Trump’s earlier nomination of Stephen Moore, a former Trump campaign advisor who thinks the president should be nominated for the Nobel Prize in economics. Objections to the men’s nominations stem in part from the fact that they are “dangerously goofy goofs,” as John Oliver put it. In a recent segment on Last Week Tonight Oliver worried that, in his previous life as a Daily Show correspondent, he’d been easily able to talk Cain (who chairs a political action committee to combat “disrespectful, dishonest, and destructive news” about the president) into pretending he had telepathy on national television. The widespread fury at the president’s nominations, however, has deeper roots than Cain and Moore’s singular lack of qualifications. After all, the Trump administration boasts a broad selection of dangerously goofy goofs. Instead, observers see in the nominations an existential threat to the credibility of the Federal Reserve itself. Central banks are imagined to be an independent force operating above the political fray. Yet observers say Trump’s recent nominations continue a disturbing trend of politicizing the Fed — the institution charged with ensuring stability not only in the US economy but the global economy as well. This trend was made apparent last year when Trump called Fed chair Jay Powell’s support for raising interest rates “loco” and “way off base.” With next year’s election looming and a recession on the horizon — despite low inflation and strong official employment numbers — Trump demanded the Fed hold off on raising rates. The pressure on Powell, combined with the Moore and Cain nominations, has created a situation that is “more overtly political than anything we’ve seen since at least the ’80s,” says former Fed staffer Julia Coronado in an article for the New York Times. Invoking the specter of former Fed chair Arthur Burns — who bowed to demands from Nixon to cut interest rates before the 1972 election — critics like Coronado fear Trump is trying to sabotage the Fed and with it any hope of economic stability. Cain and Moore are most definitely unqualified to serve on the board of governors, and Trump is almost certainly trying to bend the Fed to his will to ensure his reelection. But we should be careful not to romanticize the Federal Reserve as a neutral economic arbiter bringing peace and order to the economic landscape for the benefit of all. Trump is not threatening to corrupt an institution of the people. While Fed officials may stand above the fray in terms of political partisanship, the Federal Reserve itself is an inherently political institution. It is responsible for the smooth functioning of the capitalist engine, with making sure the thing doesn’t explode as it jerks from boom to bust. In that role its interests are clearly defined and clearly political. Nothing demonstrates this more clearly than the long period of quantitative easing (2008–2014) in which the Fed ultimately bought $4.5 trillion of government bonds and mortgage-backed securities (with public money) to steady the economy. Republican grumbling aside, quantitative easing was a bipartisan policy. But it certainly wasn’t a neutral, apolitical policy. The US government could have chosen any number of strategies to steady the ship after the financial meltdown (which many attribute to Fed policies under Alan Greenspan). It could have reined in the financial sector, nationalizing the banks like officials did in Iceland. It could have enacted a nationwide stimulus program, creating jobs and investment geared toward kick-starting a just transition to a green economy. It didn’t. Instead the Fed chose to dump truckloads of public money, month after month, year after year, into finance. Financial hustlers got rewarded, not punished. There was no stimulus program, no move toward tackling climate change, repairing the country’s crumbling infrastructure, or creating a meaningful employment program. Millions of Americans lost their homes and jobs. Half the household wealth of African Americans was wiped out. QE1-3 made the impossibly wide gap between rich and poor Americans even wider. The Federal Reserve has been a pillar of the neoliberal project. Over the past four decades, alongside the executive and the Treasury, the Fed has systematically removed New Deal fetters on finance, creating a freewheeling industry that lurches from crisis to crisis, dragging working people along with it. Hiding behind the market enabled policymakers in both parties to avoid difficult conversations about the distribution of wealth and resources in an increasingly divided country. The financial crisis ended this. Like the bartender turning on the lights at last call, the crisis shined a light on the ugliness and disarray of financialization. After decades of haziness, the 2008 crisis and the elite-focused response that followed revealed the mechanisms of Third Way power, spawning a deep crisis of legitimacy that put a scoundrel in the White House. The exposure of the mechanisms — low interest rates, corporate stimulus, tax cuts for the wealthy — that policymakers use to engineer stability and profitability, at least for the rich and powerful, explains Trump’s brazen demands for Powell to do his bidding. The cat is out of the bag. Despite the best efforts of liberals to reassert the narcotic power of “market forces,” questions of distribution are squarely on the table. The Trump camp is pursuing a straight power grab to achieve their agenda, with no qualms about propriety and the sanctity of government institutions. We should be equally bold. The game is rigged. Institutions like the Federal Reserve are tasked with ensuring the smooth reproduction of a system that generates poverty, alienation, and ecological destruction — a system designed to put profit over people. The knee-jerk response to Trump’s attacks on NAFTA, NATO, the FBI, and now the Federal Reserve is often to defend these institutions and arrangements. But we shouldn’t defend the Fed. We should take advantage of the political opening created by neoliberalism’s legitimacy crisis to demand a democratic reorientation of the Federal Reserve toward the interests of Main Street — not Wall Street.